Priority: The priority of your mail server. The smaller the number the higher the priority will be and more used with the system. SMTP Server: On this field you write the email outgoing server address, this can be Gmail, Outlook, Yahoo, Live or a private server, see the chart at the end. SMTP Port: The port it uses to communicate with the server, 587 or 465. Connection security: Chose the type of security, SSL or TLS. Username: Write here the email address that you want to use to sent the email messages, remember that it must match the same SMTP server you are using. When completed all fields it should look like this: Will verify pressing the Probar conexión if it is successful, our messages our messages will go out the platform. So every message will be send on a lapse no longer than 5 minutes. In case you ignore the values used to setup the fields for the popular mailing services, we present you the following chart that has the corresponding values. Note: Hotmail, Live and Outlook uses the same server, the only thing that changes is the e-mail account for the corresponding domain. 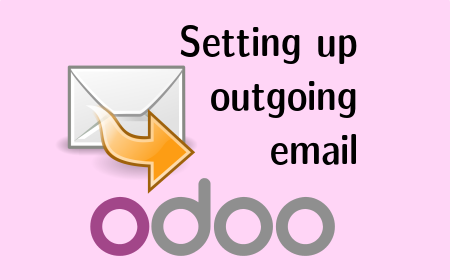 (yourname@hotmail.com, youname@live.com or yourname@outlook.com) We hope that this information is useful so you can keep getting the most out of your system with Odoo. If you find issues when setting this up please don’t hesitate to get in touch with us or leave submit an issue on our so we can fix it shortly . Excellent and productive start of the week.